Touch the heart of the Langtang Himalaya range - 18 days trek from US $ 630, Less touristic and rural area of Nepal. 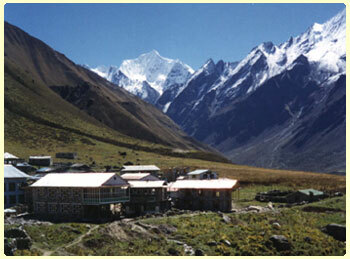 The trek also can combine with Bridim home stay trek - known as Tamang heritage trail. You will also have choice to combine this trek with Birdim home stay trek - Tamang heritage trail or Ganesh Himal camping trek. A bus drive to Syabru bensi (125 Km), north east of Kathmandu, brings you to the starting point of this spectacular trek to the awesome Ganesh Himal and Langtang region of central Nepal. Moving up a gentle gradient, you pass along the dramatic ridges, through villages inhabited by the Tamang people, into lush forest of Rhododendron, conifers and oak, and passed mountain cattle grazing on rich alpine pastures under the watchful eyes of their herders. Breathtaking Mountain views immerge on your ascent as the vegetation becomes sparser and the conditions more challenging. Once the Gosainkunda (known as frozen holy Shiva lake) pass 4600 mtr is behind you fluttering Buddies prayer flags, brightly painted chortens, Maniwalls and yak herders welcome you to the land of these high mountain people. Langtang, Dorje Lakpa, Ganesh Himal, Manusalu, Gorkha Himal and Annapurna proudly show above as you head for the main Langtang and Helambu trail. This adventure takes you of the bitten track into the lights of a hardy, untouched people. You will have enough time to explore and relax in Kathmandu. Day 01 : Arrival day, check into hotel and rest. Day 03 : Drive to Dhunche / Syabrubensi, stay there. Availability: Every week through out the year how ever (June-Aug) is not recommended.